Prehistoric Snakes on a Plane..? In short: it’s better than The Lost World but by no means is it good. 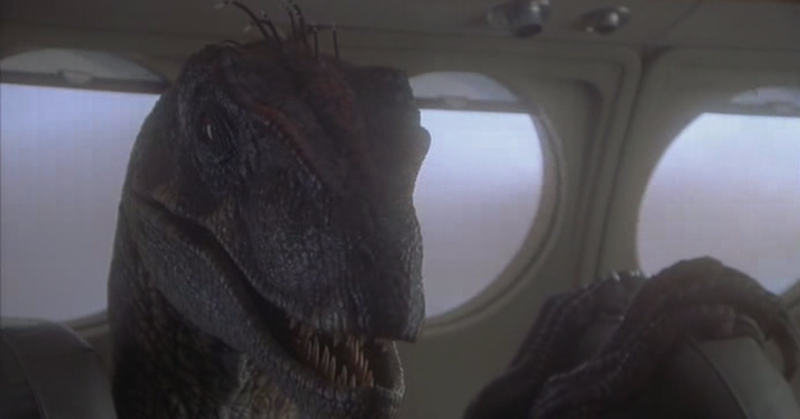 Fifteen minutes in there’s a talking raptor in a dream sequence – enough said. If I’m interpreting it correctly, this movie posits that Isla Sorna is some kind of magical island that can turn a kid into a survivalist and repair a broken marriage. It also, quite absurdly, ups the ante by retconning the raptors so they’re now even smarter, better at communicating, and (in the case of the males, apparently) have feathers on their heads. I think the slight saving grace, and the only reason I rate it more highly than The Lost World, is that the action sequences are more effective and suspenseful. Watching both sequels now has made me worry that I view Jurassic Park through rose-coloured glasses and perhaps it doesn’t deserve the 9.5 I gave its 3D rerelease; but then, it’s got that nostalgic place the others don’t have – it’s part of my childhood – so I still love it. This entry was posted in 2001, 4.5, Reviews and tagged Film, Movie Reviews, Movies on January 5, 2014 by moviesandbacon. In some ways this is a difficult movie to judge. It’s written and directed by Louis C.K., one of my favourite people, but he was apparently fired during the editing process (after which point it was extensively reedited) and has effectively disowned it. In a sense it can be pointed to as the justification for FX’s decision to give Louis complete creative freedom in making his crazy-good TV series Louie: Pootie Tang is what happens to Louis’ work when he doesn’t have creative freedom; Louie is what happens when he does. Some actors and comedians I really like are in it: J.B. Smoove (Curb Your Enthusiasm), Reg E. Cathey (The Wire), J.D. Williams (The Wire), Chris Rock, David Cross (Arrested Development) and Todd Barry. However, putting aside my feelings about them (and Louis himself), I have to be honest: it’s pretty bad. I got the feeling it might have been better with a more talented comedic actor in the lead role. Most of the 3.5 goes to Wanda Sykes and her hilarious dancing as Biggie Shorty (plus her memorable line, “You think that just cause a girl likes to dress fancy and stand on the corner next to some whores, that she’s hookin’?!”) . Wa Da Tah! This entry was posted in 2001, 3.5, Reviews and tagged Film, Movie Reviews, Movies on January 5, 2014 by moviesandbacon. Powerful movie about an ex-cop’s efforts to fulfil a promise he made to the mother of a murdered child – and to build a life for himself. In many ways it resembles a gazillion other crime drama stories, but several elements elevate it from the crowd: adept direction from Sean Penn, an understated but wholly effective lead performance from Jack Nicholson, a large cast of excellent performers, and an unwillingness to fall into cliché traps (except the occasional red herring – but that’s more a storytelling trope of the genre rather than a cliché as such). It’s pretty depressing (particularly the numerous simple but crushing depictions of grief, and the ending) but it’s definitely worthwhile. This entry was posted in 2001, 7.5, Reviews and tagged Film, Movie Reviews, Movies on January 5, 2014 by moviesandbacon.